Interactive content is like food delivered by world-class chefs who are always looking for ways to be at the forefront of the latest food trends. Like interactive content, the food top chefs create eye catching, talkworthy and fulfilling food. They satisfy different needs like your content purchase funnel. Take a page from how these food masters focus on the customer experience to keep customers coming back for more of their premium priced food. 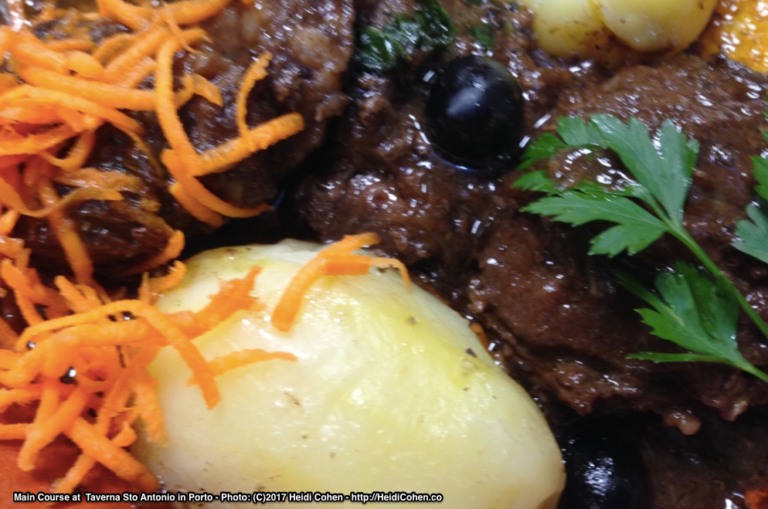 This was particularly notable on our recent trip to Portugal where a basic meal at a local tavern is hearty and reasonably priced. Yet if you’re in search of world-renowned masters to prepare your food, expect to pay a premium. 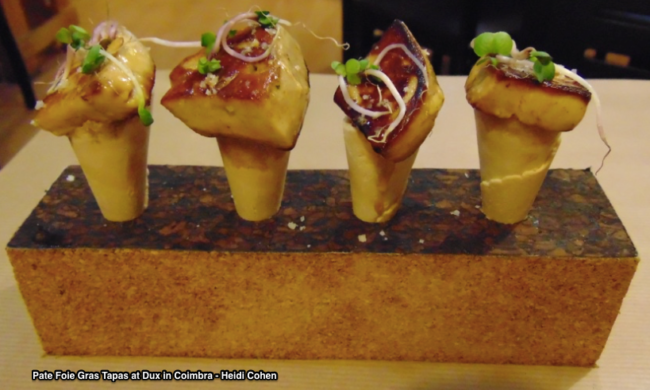 To reach broader audiences with eye candy and nutrition, chefs offer 3 types of food. Snacks: Tend to be small sweet indulgences that satisfy your sweet tooth and are light on your pocketbook. They can be eaten any time. 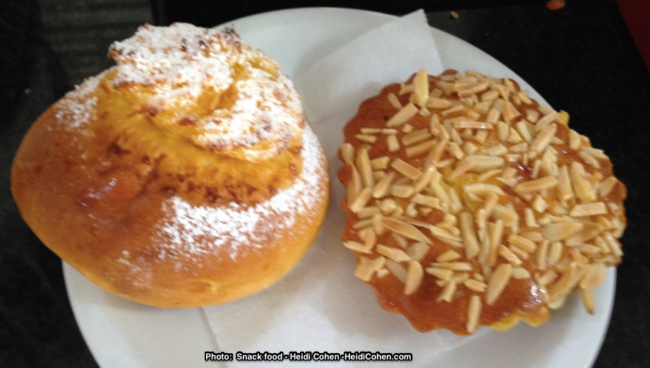 Examples: Pastries and gelato. Tapas: Are small dishes originally from Spain often accompanied by drinks. While more pocketbook-friendly than a full meal, a number of them are needed to fulfill a real hunger. Examples: Cheeses, seafood, and cured meats. Full meals: Provide an array of food eaten together possibly accompanied by wine or beer. Full meals are priced a la carte or prix fixe. Examples: Include starter, main and dessert. Like haute cuisine, interactive content attracts visitors to your website, blog, content, social media or other offering. It makes your content offering look mouthwatering good. Consequently you can cut into your audience’s never-ending social media feeds, always-on apps, and time consuming games. Snacks: Attract attention. Yields increased traffic, time-on-site. Also improved branding and shares. Full meal: Engage prospects further leading them towards purchase. Yields warm leads and sales. Instead of cash, your visitors pay you with their focused attention. They give you their one truly scarce resource: time. Because content interactivity pulls your audience out of their current information path. 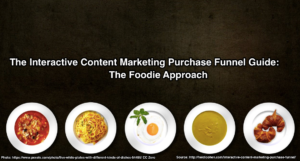 This snacks, tapas and full meal approach to interactive content marketing better explains the essence of what makes interactive content effective. 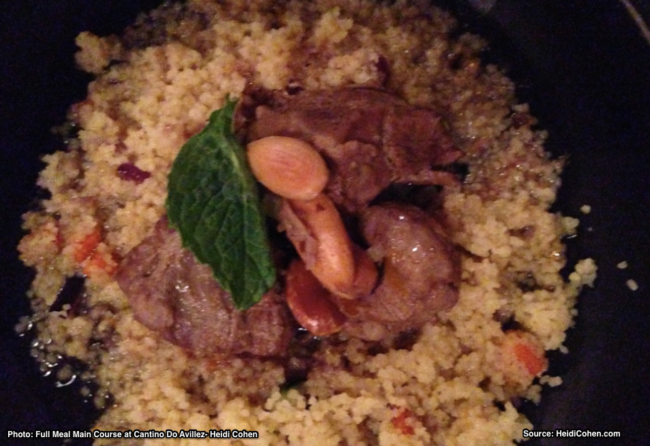 Chefs offer different types of food to draw you into the eating experience. Dining isn’t just about getting nutrition to keep going. It’s an experiential journey where every element has a key role to play. Content marketers who use interactive content to pull their audience into their purchase process can learn from these chefs. They prime their diners. Anyone who has eaten at a top restaurant has started with a special treat from the chef known to get you into the mood. 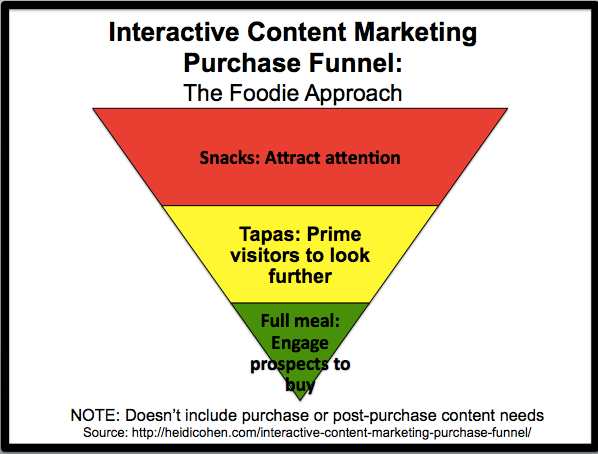 Similarly your interactive content uses these 3 food types to pull visitors you’re your purchase funnel content. Snacks satisfy cravings quickly. They’re small, highly engaging, eye catching, must have now content. This interactive content focuses on the top of the funnel although it can also provide stop gap hunger in the middle of the funnel. Tapas provide more focused information in an easy-to-consume manner. You’re competing against the clock to get your information consumed. It should answer your prospects’ questions Marcus Sheridan style. 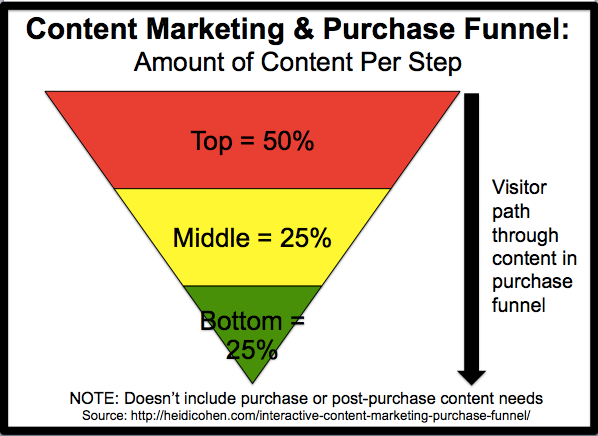 It’s middle of the funnel content that can also be consumed at the top or bottom of the funnel. Full meals offer content that helps close sales. By this point, visitors are ready to spend time talking to sales or engaging with your content to select the product or service they want. This is bottom of the funnel content that visitors may seek at the middle or even top of the funnel. While most people eat 3 meals a day, morning, noon and night, when it comes to special food offerings, they don’t necessarily choose their food intake in a give order. This is also true for interactive content. Like regular meals, it’s easy to think of the purchase funnel in linear terms. But the reality is that most of your potential audience doesn’t always take a linear or same path to your content or through your content. This means you must optimize content for findability and distribution. 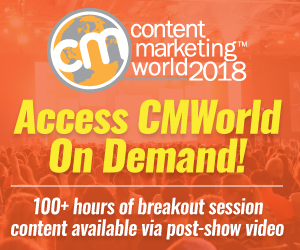 To support this, provide interconnected content (aka: on-ramps to and off-ramps from your content). Even new iterations of the purchase journey reveal that shoppers don’t take the same path. Here are McKinsey’s and Forrester’s versions. These maps illustrate how visitors break out of the linear approach to the purchase funnel. Yet marketers keep using the same linear purchase funnel approach. 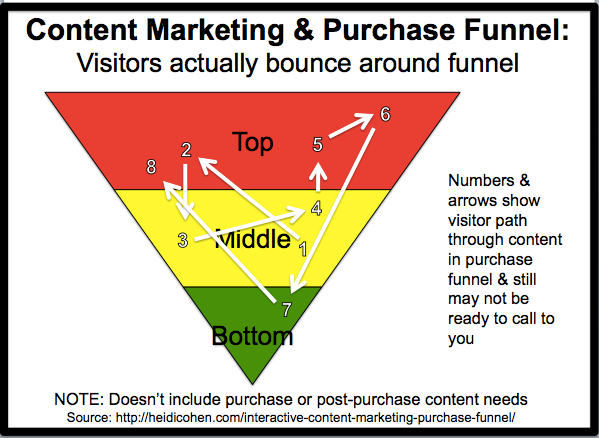 This is how the purchase funnel appears when it’s applied to content marketing. To ensure your content, especially higher priced interactive content, reaches the maximum possible audience, it’s key to understand your audience and their information needs. 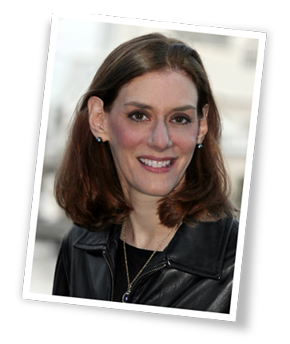 To help you, here’s how to create a marketing persona. While defining your marketing persona, understand what information your audience needs at each of the 4 marketing moments of truth and other purchase triggers. The major key to interactive content marketing success is putting yourself in your audience’s shoes. 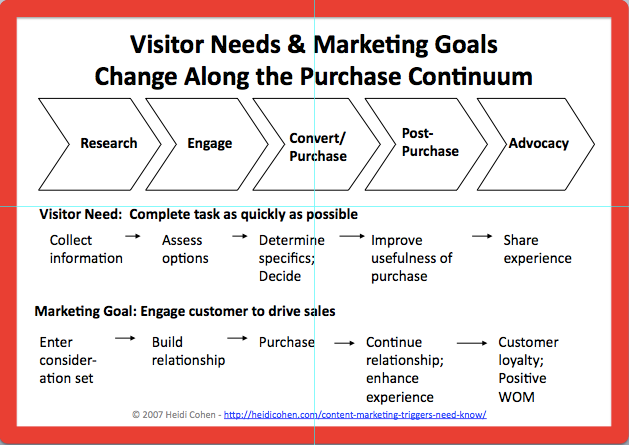 Focus on visitors’ needs and wants, not your sales pitch. Sorry it’s not about you but about your prospect. To this end, provide all the information they need. To succeed offer a broad array of information to your audience. As a result, provide dynamic options. For example, if you’re using a mapping app to go somewhere, it recalculates your route when you make a wrong or unexpected turn. Best-in-class interactive content provides your prospective audience with a multi-directional approach to your treasure trove of high quality information. Think of it as a mapping app for your content allowing readers to select their own route. When creating content for your prospects ensure you’re offering a selection of options. Like a chef allow visitors to consume your content how, when and where they want. Offer visitors the content equivalent of take-out and doggie bags. To this end, avoid content dead ends! Offer visitors options along the interactive content marketing purchase funnel but not too many or you’ll wind up with the paradox of choice! Avoid visitor bounces. Show visitors how far through your content they are. Allow for “None of the above” answers. Also offer them further content, contact or purchase. Let them say “All of the above.” Don’t make them think! Then allow them choose what they want next. Include the ability to send it via email. Offer an “Other” option. Don’t assume you know everything. (You don’t!) Let visitors fill it in or contact you. Include a contextually relevant call-to-action. Where possible provide limited options. Allow them to contact you or purchase. Use tailored landing pages. Continue your branding and visuals. Also make the page measurable. Provide relevant off-ramps. Guide visitors to relevant content or other information. Allow visitors to contact you. Don’t make them search for your “Contact Us” button, link or phone number. Additionally include an About Us page. Show them someone is home. Like the snacks, tapas and full meals offered by top chefs, your interactive content marketing must address your visitors’ content wants and needs regardless of where they are in the purchase process. To fulfill the maximum number of information needs before better qualifying leads, ensure that your interactive content is available wherever and whenever your prospect wants it. 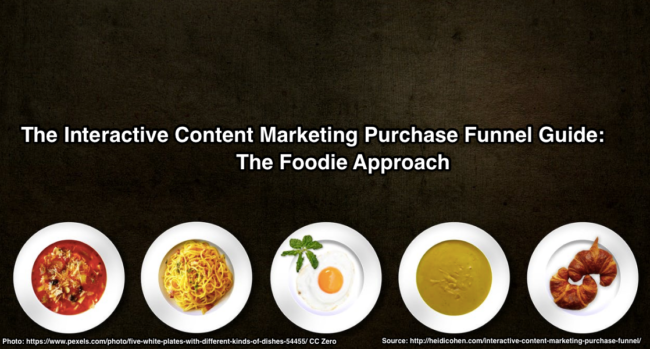 Use the interactive content marketing purchase funnel to offer your information hungry visitors the interactive content options they’re seeking and/or prefer. 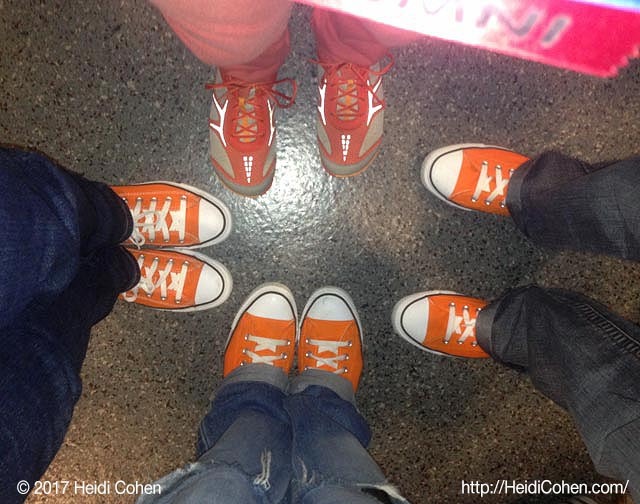 Other photos: Heidi Cohen – Permission is granted to use them if you link back to this post. 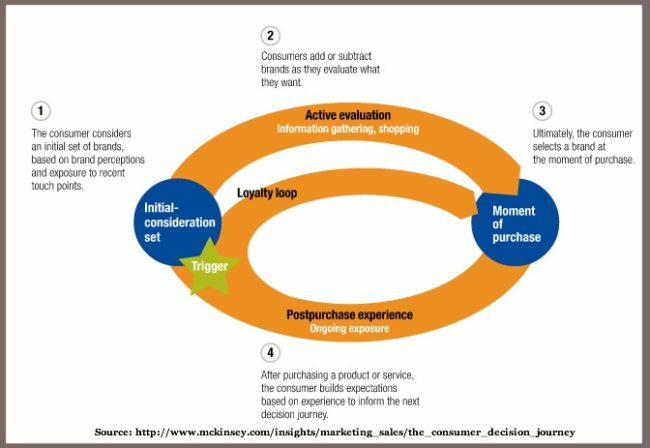 Tags Customer Journey, Forrester, Hubspot, Interactive Content, McKinsey, Purchase Funnel. Bookmark the permalink. 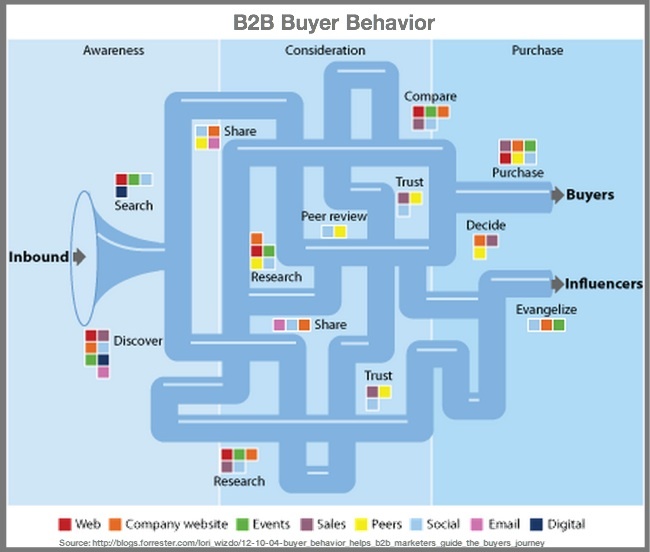 I think it’s important to keep in mind how the buyer path, in actuality, doesn’t follow a neat formula. People jump around and go through several stages before making the decision to buy. That’s why, as you said, it’s important to avoid dead ends and keep your readers engaged and with places to go (or at least have an email optin exit ramp). Thanks a lot for sharing it that truly has added a lot to our knowledge about this topic.